The led version that I have built some years ago (scroll down to former version) didn’t really satisfy me. Because its light pattern mapped on the street consisted of four spots – but the center between them was still dark and not illuminated. 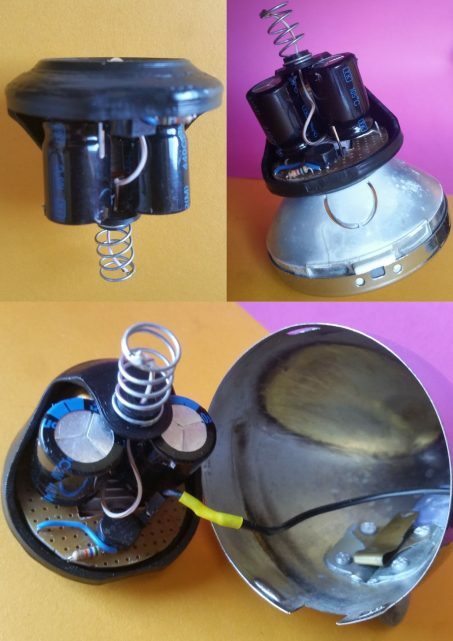 Therefore I wanted to build a better spotlight with just one single 3W led. I soldered the circuit onto a board and both drilled and filed a hole for the quadratic heat sink of the led. Using a dremel tool I could cut the circuit board to its circular shape. Then I designed a housing for the circuit, that allows the led to look through. 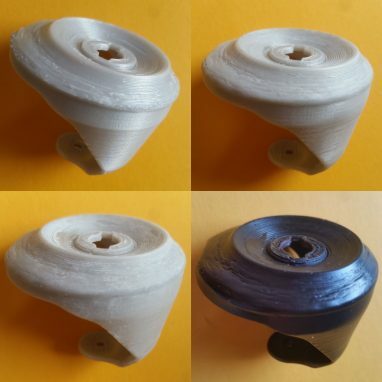 On Instructables I found an interesting article about smoothing pla prints(http://www.instructables.com/id/How-to-Smooth-PLA-3D-Prints/). I tried out some of the advices by firstly removing the supports, then wet-sanding the plastic. After that I used acetone to smooth the surface a bit more (acetone is usually good for smoothing abs prints, but works with some pla brands as well), and added two layers of matte black spray paint. 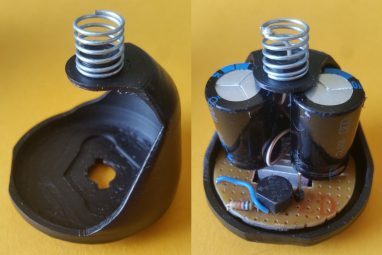 One contact powering the led’s circuit is established by a single pin, the other one is attached to a spring, that will press against the inside of the metal housing of the lamp. 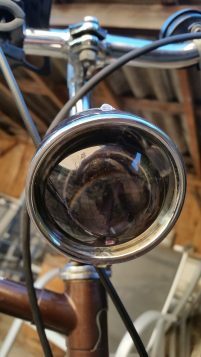 The glass lens is taken from the lighting unit of an old slide projector. I printed a caddy for it, so that it can be installed securely between the reflector and the front part of the metal housing. The illumination is better than the old version, providing a oval field of light, that is bright in the front and fading proportional by the distance between the lamp and the street. 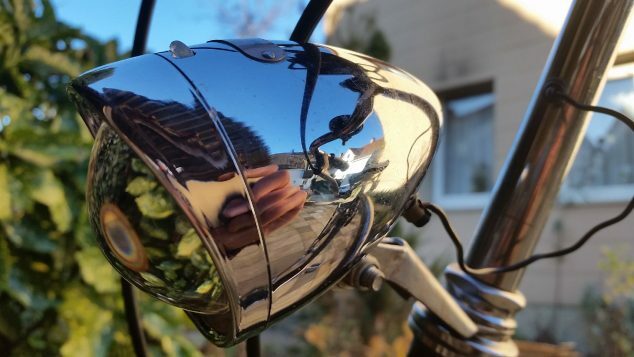 Even though, it is not comparable to industrial bicycle lamps in terms of lighting but definitely fits my beautiful old bicycle the best. Ich fahre sehr gerne Fahrrad. Um auch in Dunkelheit gut zu sehen und gesehen zu werden, ist ein lichtstarkes Frontlicht unabdingbar. 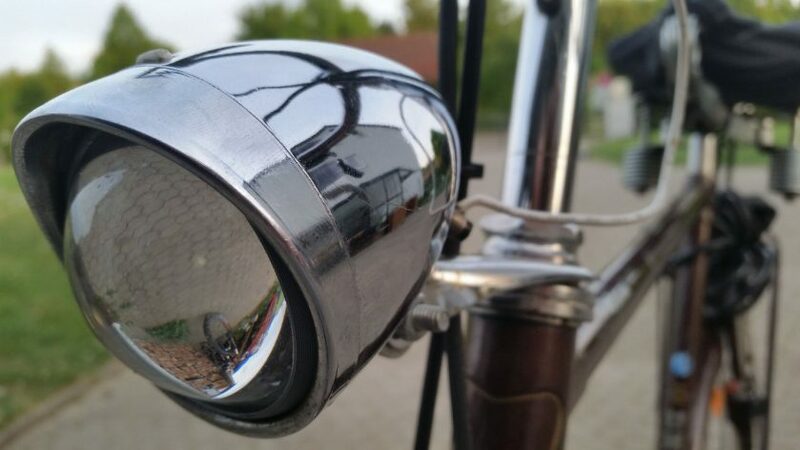 Die ursprüngliche Halogenlampe in dem Lampengehäuse wird von den aktuellen LED-Fahrradscheinwerfern im wahrsten Sinne des Wortes in den Schatten gestellt. Bei Amazon habe ich mir diese 1W High Power LEDs gekauft: SODIAL Power star LED. Für dieses Projekt werden lediglich vier dieser LEDs verwendet. 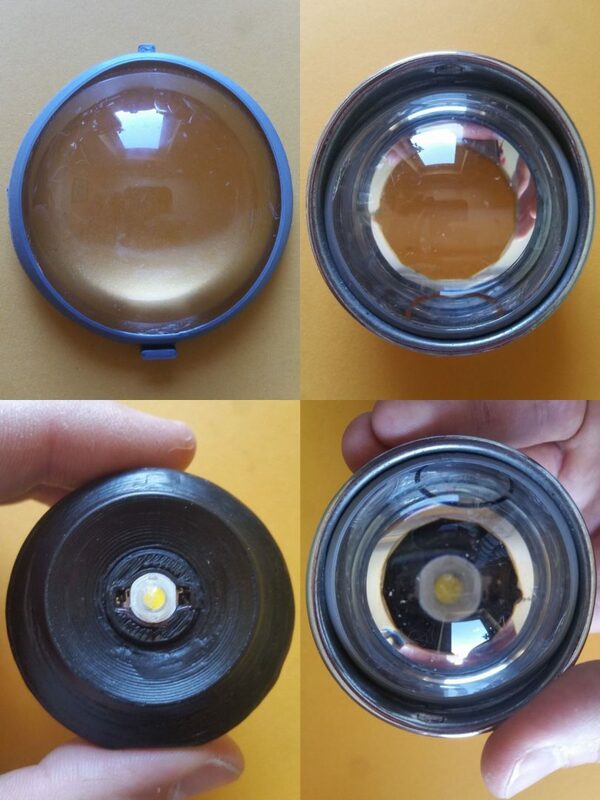 Jeweils zwei LEDs werde in Reihe geschaltet. Die beiden LED-Paare werden mit entgegengesetzter Polarität parallel verbunden, sodass von der Wechselspannung des Fahrrad-Dynamos beide Halbwellen ausgenutzt werden können. Die Kühlkörper habe ich soweit verkleinert, dass alle vier Leuchtmittel sehr nah bei einander sind und in die Öffnung des Reflektors hineinpassen. Leider habe ich von diesem Zusammenbau keine Aufnahme vorhanden. Mittels Linsen eines alten Scanners oder eines Dia-Projektors, kann das Licht gebündelt auf die Straße gelenkt werden. Im Nachhinein stelle ich fest, dass es vermutlich besser ist, eine LED anstatt der vier zu verwenden, sowie einen besser angepassten Reflektor.